Oliver is just so adorable and cute. 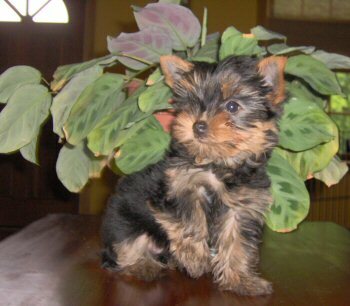 He is very sweet, and he has the calmest, most pleasant personality of any Yorkie that I've ever owned. Everybody loves him, and he loves everybody! He always makes us laugh with his deep bark, which doesn't match his small size. I'm often asked where I got him, and I'm happy to give people your web site. 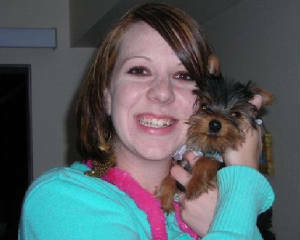 Oliver's mom is Cindy Mae and his dad is Art of High Class, which makes him a Biewer F1 Yorkie. 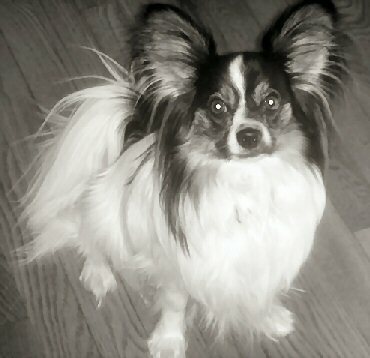 At 8 months he weighs 5.5 lbs. By the way, we named him Oliver for the main character in the old sitcom "Green Acres". The Cates Family thanks you! Hi. This is BRENDA. she is a daughter of Peanuts & Bambi. 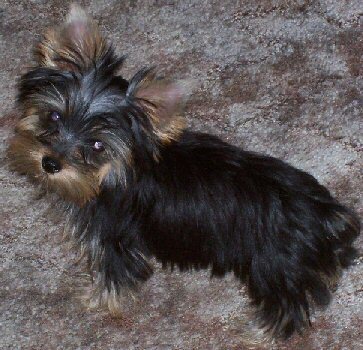 She is about 3-31/2lbs and 7mon.now. She is the love of my life! She's so special, i actually had to make 2 trips to TN for Brenda. The first time she was too small & became sick. so i waited for her,while Roberta cared for her until she was healthy enough. She was worth the wait. 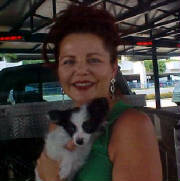 Roberta was such an angel to care for my Brenda & she's been such a great help to this day. I would recommend Green Acres Farm to anyone who truly is looking for their dream pup! Here's a photo of Snowflake taken in June, @ 8 months, about a month before I took my mission trip to Tanzania. She did really well with her "Baby sitter", and the lady just loves her. 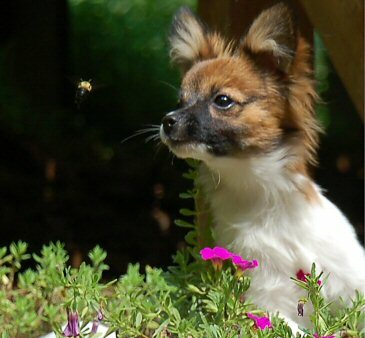 She's a wonderful little doggie!! I just wanted you to know that the former Snowbear is doing very well. Her new name is Mitzi Monique and she is 10 months old now and weighs 4-1/2 lbs. We are really enjoying her and glad that we found your place. I recommend several people to you all the time. Congratulations!!!! 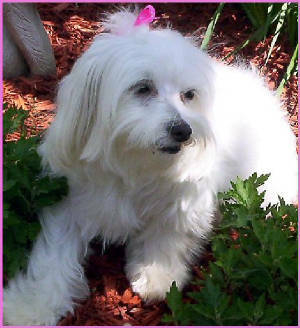 Your adorable dog, Mitzi has been selected as our December 2006 dog of the month. 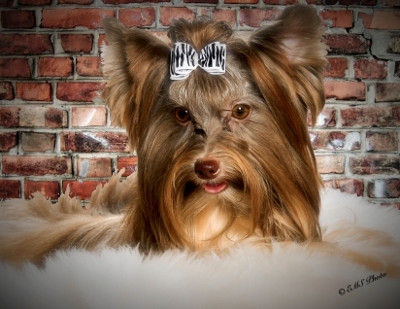 Her picture will be displayed on this web page http://www.thedogshows.com/televised.htm on December 1st. 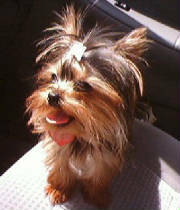 Please tell all your friends and family that Mitzi picture will be displayed on this website starting December 1st. Thanks to Green Acres Farm. 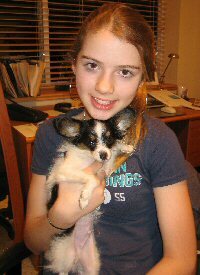 After a month long nightmare of trying to deal with getting a suitable papillion puppy to Alaska in the middle of winter for a 12 year-old's birthday present - God interviened and we found Green Acres. They were quick in their responses to our questions, addressed our concerns promply, had a lovely facility where the puppies obviously were well cared for and well socialized. Would buy from them again in a heartbeat. hit, everybody just loved her. 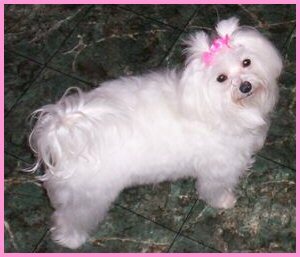 I purchased GiGi in May of 2005 from Roberta. She is my little shadow and has brought so much joy to my family. and plays with her half sister Eva about once a week and they love one another very much. I would recommend Roberta to anyone. She has the most adorable and healthy puppies. Thank you for raising the most wonderful dogs. Eva has brought so much joy to us. No matter where I take her , people stop and inquire about her. Eva has a loving, wonderful disposition, a true testimonal to your impeccable breeding. Thanks for all your hard work, love and dedication. We have certainly benefitted from it, as our Eva is purely a little angel. 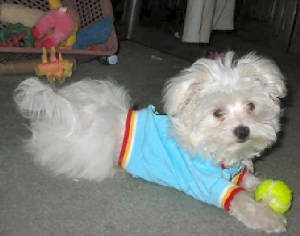 This is our malti-tzu, Bandit. We picked his name because of his black mask - he is 7.2 lbs and 9 months old as of September 1st. He is a great puppy and I purchased him last February when I was living in Lake Mary Florida and we are now back in New Hampshire where we started. He is a great dog and fun to watch as he grows into a young man!!! He loves Cheezits - we ration him but occasionally he gets a couple for a treat. Im writing to tell you how much I love my new Family.They Love me so much. I have 2 big brothers that I play with,they think they can take my toys from me,but my new Mommy comes in and makes them give them back to me. She doesn't know it but I can handle them. 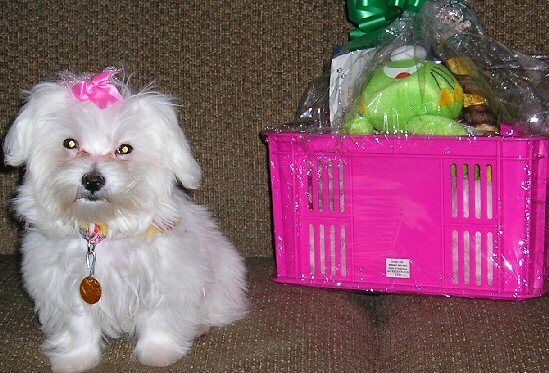 We went to a place called Petsmart a few times.I love to go there because my Mommy & Daddy always buy me some new toys. I went to a place called a Vet, I did not like that place to well,but it was all good when I got to go to Petsmart when we left. I heard my Mommy talking about showing me soon, I think this means she is so proud of me. Well Grandma I will close for now, but I want to thank you for all the wonderful things you did for me before I came to my new family,and let you know I will always remember and love you and my other Siblings too. Hello...sorry it took so long to answer, my computer took a crash. "Connie" did great on first leg of trip but got sick all over herself on second & was so glad to be held & snuggled by me when i opened crate. She adjusted to house very quickly & Willie seems to know she is his mate and is very protective of her! 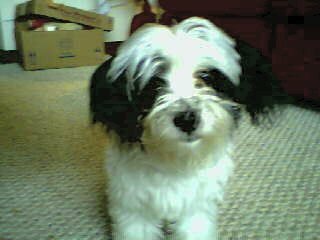 I put her crate on my night stand the first night so I could put my fingers in crate if she cried & turned on meditation sounds & she slept 5 hours with Willies nose against crate door!!! !Her bowels &bladder are functioning perfectedly and she is eating both her bowl of food (what you sent), lamb & rice sausage stick(natures balance)as a treat plus the other dogs tiny bites morsels.Finally decided I better put the food up before she made herself sick.This next part please add to your feedback page on website! 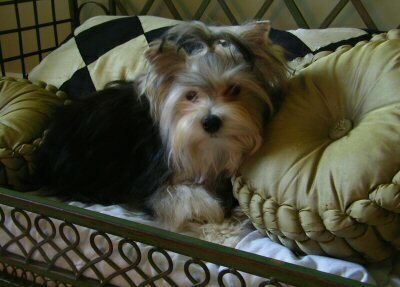 I purchased "Pauline" because of her markings & size but what I got sure was a shock! 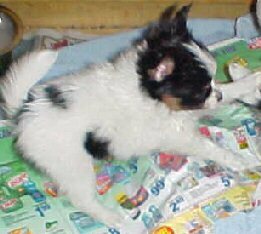 She is the brightest eyed smart & affectionate papillon puppy I have seen in the past 9 months of searching for a female to go with my male for breeding. She adjusted within hours to our home and within minutes to our other paps. This is a testament to your breeding and care of your animals. It shows the true love & nurturing you provide underfoot and in the home. Within 2 days she has already started alerting me that she needs to go outside like my other dogs by going to the door, quite smart for just being 11 weeks. I see a long future of working with you and Green Acres & if anyone is looking for a pup for show,breeding,stud or just a family pet to love I highly recommend they contact you first & will be referring anyone who is interested directly to you & your website. She is incredible Roberta and I truly believe it is a testament to your breeding.She has stolen everyones heart here even my truck drier of a husband who has had her snuggled on his chest the last 2 days sound asleep, she even seeks him out in the bathroom already...guess I know whose dog she will be...hahahaha! !I Myself I can't hardly wait the few years of showing to see what kind of litters these 2 will throw us plus what all championship awards she can get under her belt will determine the future value of the pups.I can't thank you enough or frankie & monique for my sweet angel Connie! I recently purchased a puppy from Roberta. He is so precious and we just love him. He was only a day old when I told her I wanted him...she was so good about sending me pictures and telling me how he was doing. He arrived in a healthy condition and has adjusted so well. You can tell her puppies are loved and well socialized. He already potties outside ( I take him often and he always does his jobs ). He loves the grass and "bounces" all over the yard. He loves to play. All his paperwork came with him along with Robert's guarantee. I will recommend her to others. Wags loves to be outside. 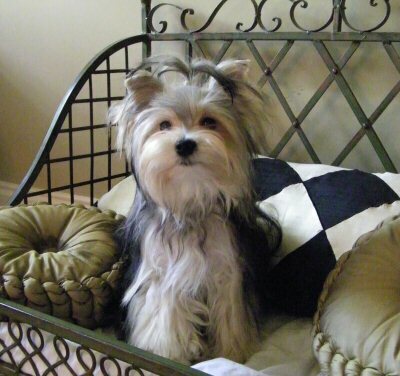 He is a sweet, well behaved pet and has bonded with all members of the family. He has several playmates we take him to visit on a regular basis and a few come to see him. We want him to be socialized as much as possible. He loves our 4 kids (youngest is 18) and they're all fond of dogs so he's very happy pup. We're very satisfied with him and would highly recommend you to others that may be interested in a new pup. Thanks, so much, for everything. 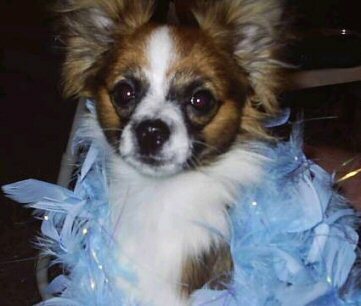 Hi there, Just wanted you to see BINGO and let you know that he is fabulous and the best dog we ever had. Brilliant & an extrovert! 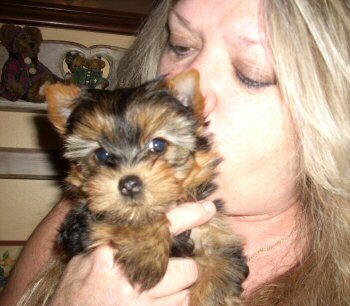 Hi Roberta, Zoey is getting along with everyone very well. She is enjoying her new yard and just loves Bailey our one year old Welsh Corgi. And of course we our totally in love with her. She is so precious. She started barking last week and is now starting to give me kisses. We are still trying to learn how to walk on a leash but I am sure she will learn very quickly. She is a smart little baby. I gave her a bath last week and she did not care for that much. She is going to the vet today to get a check up and whatever else she needs. I would like to mail you some pictures. Could I please have your complete mailing address? I would appreciate it. I got the pictures you sent. Thanks. Thanks for Zoey. WE love her.